As you all know I’ve been trying to eat a bit healthier especially with summer just around the corner. With the weather being so beautiful lately it was time to fire up the grill, and get cooking! This Grilled Cod with Lemon Thyme and Garlicky Green Beans is the perfect weekday meal. From fridge to table in less than 30 mins! I made a traditional tartar sauce with a bit of a kick but if you aren’t into a spicy sauce feel free to omit the Sriracha sauce. I hope you enjoy this light and quick meal! Pre-heat the grill over medium heat. Line a cookie sheet or metal pan with foil paper (I use an old cookie sheet). Spray the foil paper with a bit of non-cook spray. Place the cod filets on the cookie sheet spacing them evenly. In a small bowl melt the butter in the microwave approximately 30 seconds on high. Evenly baste the melted butter over the cod, so that it’s completely coated. Sprinkle the cod with the paprika and the lemon thyme. Place on the grill and cook for about 10 minuets until the fish is cooked through. The fish should flake with a fork when done. While the fish is on the grill cooking get the green beans started. Seriously these are the easiest green beans and they are delicious! I love to use the frozen organic ones that I purchase from the local big box store. Place the green beans, 2 Teaspoons butter, garlic powder and 1 Tablespoon of water in a microwave safe container; cover and microwave on high for 3 minuets or until tender. To make the tartar sauce combine the mayo, ketchup, Sriracha, garlic powder and pickle relish. Stir until every combined and set aside. 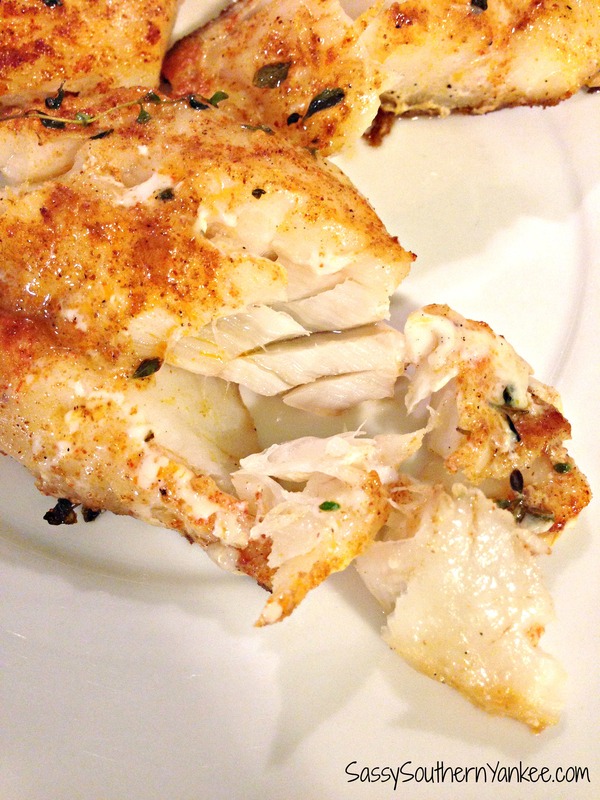 Remove the Grilled Cod once the fish is cooked through and flaky. Serve over the garlicky green beans with a side of the spicy tartar sauce (Serves 4). Enjoy! If you have a chance let me know what you think in the comments! 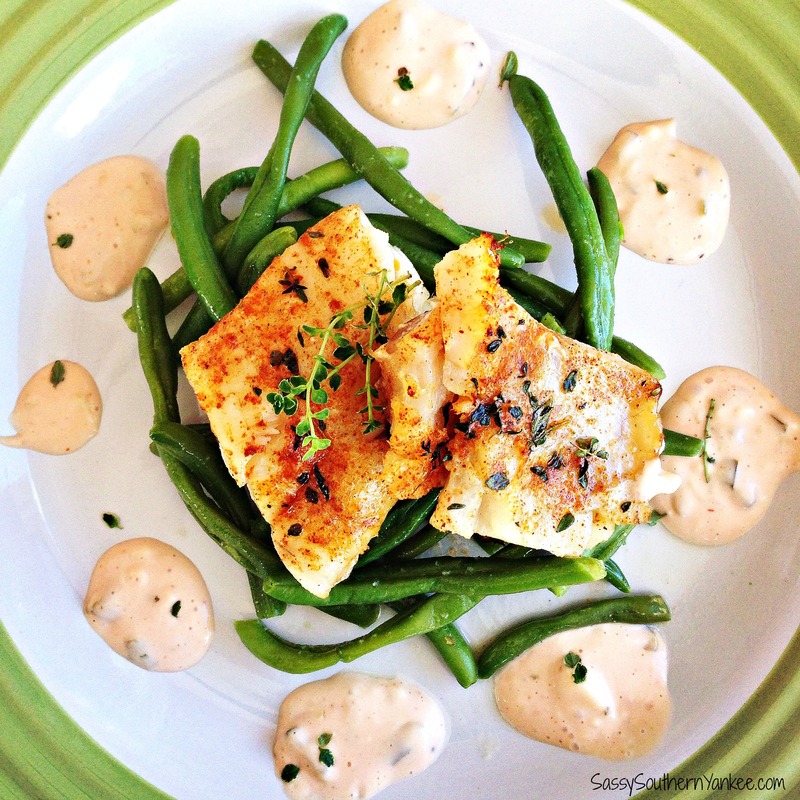 This Grilled Cod with Lemon Thyme and Garlicky Green Beans is the perfect weekday meal. From fridge to table in less than 30 mins. 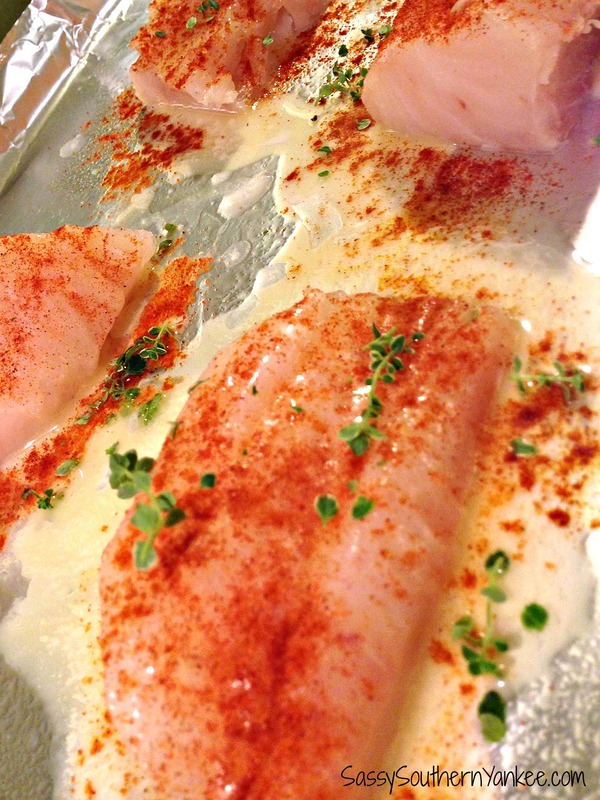 Place the cod filets on the cookie sheet spacing them evenly. In a small bowl melt the butter in the microwave approximately 30 seconds on high. Evenly baste the melted butter over the cod so that it's completely coated. Remove the Grilled Cod once the fish is cooked through and flaky. Serve over the garlicky green beans with a side of the spicy tartar sauce. Enjoy! If you have a chance let me know what you think in the comments! 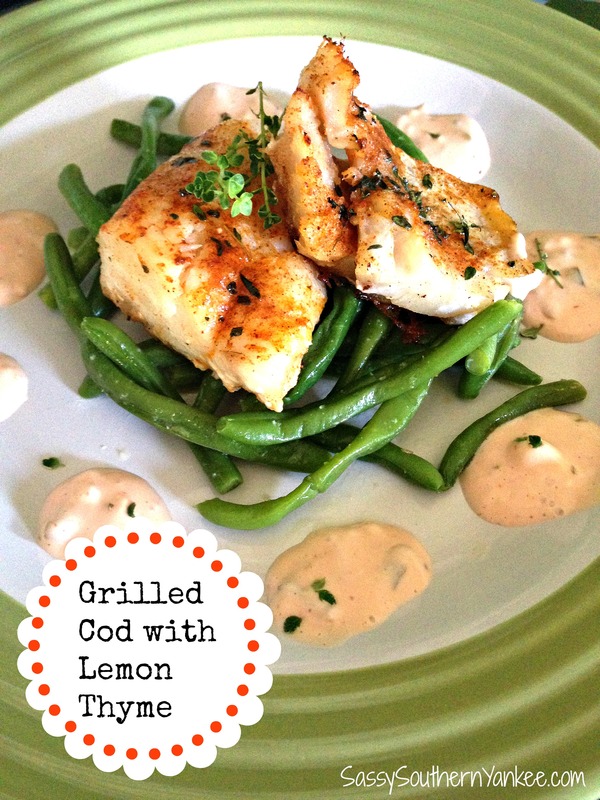 This entry was posted in Main Course and tagged 30 Min Meals, BBQ, cod, fish, fish dinners, Garlicky Green Beans, Grilled, Healthy Meals. Sounds yummy but do you put the fish directly on the grill or on top of the foil or with the cookie sheet? Thanks! I place mine on a bit of foil on a cookie sheet, so it will not stick and fall through into the grill. I hope this helps! You might have to call in a few friends for this one. Monitoring your fish while simultaneously pushing green beans around in a pan is no cake walk. I can’t imagine attempting this recipe alone. I’d have one guy watch the fish and another person with eyes on the G beans. Make sure you have plenty of water around in case someone passes out. Also watch your 6 for any unexpected distractions. Remember stay focused, use earbuds and eye protection. Clear eyes, full heart, can’t lose.